Welcome to the seventieth week of my PokÃ©mon feature here on Game Podunk! In case you missed the last one, check it out! Stay tuned for future entries coming every Friday. Manaphy is live on the Nintendo Network until June 24th, 2016. Every single Mythical PokÃ©mon will be distributed during a specific month for the remainder of this year. Now may be your only chance for a really long time, to actually catch them all! The PokÃ©mon Collective is buzzing about wristwear. 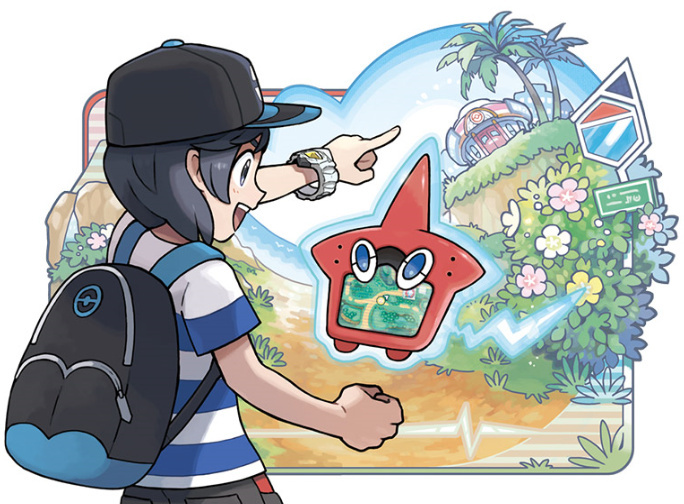 What kind of fancy gear is the Alola Trainer wearing on his wrist in the Rotom-PokÃ©dex Artwork? Rather than offer up E3 Predictions like I did around this time last year, I“m going to take some time to explain â€œSynchro Evolution.â€ It means I“ll have to bring up the anime again, which I“ve rarely done in the history of this feature. But I think I“ll be doing that a bit more as I analyze, since the show seems to be moving a few beats ahead of the games. There are two things Sun & Moon haven“t accounted for yet: the new forms of Zygarde introduced in PokÃ©mon XYZ and Ash“s Greninja. â€œSynchro Evolutionâ€ relates to the latter -- although I think we can expect at least a side-plot or post-game content devoted to the former in November. Now, I haven“t watched the show in quite some time, so I“m only gleaning from sources like Serebii. But from what I gather, Synchro and Mega Evolutions are pretty similar. But the key differences lie in the fact that only Ash“s Greninja has been affected by the Thing so far, and -- well, when you â€œsynchronize,â€ it also means the trainer gets hurt if the PokÃ©mon gets hurt. Instead of debating mechanics and how this new form of evolution could affect multiple PokÃ©mon and be an addition or alternative to Mega Evolving in battle -- I“m going to talk narrative instead. â€œPrimal Reversionsâ€ were a concept introduced in Omega Ruby & Alpha Sapphire for the first time, and those stayed specific to the Hoenn Legendaries. Rayquaza“s a different beast with a completely different Tournament Tier; we“ll save that for another day. What if -- instead of being some Big New Sweeping Thing in Generation VII that will alter the metagame, Synchro Evolution is mitigated to only serving a narrative purpose and affecting just a single PokÃ©mon? See the way the Alola Trainer grabs that Litten and pulls it close, offering up interaction on a previously unseen level? This kind of interaction kinda speaks to me, a little bit. I“m of the school of thought that -- rather than offer up significant changes that affect multiple PokÃ©mon like Mega Evolution -- Synchro Evolution will primarily be a narrative device that bonds Alola Trainers with their starters unlike any other game in the series. Rather than serving up Mega versions of the Alola starters -- â€synchronizedâ€ versions of them would make them feel much more unique and important, in my eyes. There are a few holes in my theory, like how the story would account for folks who keep Popplio in its innate form instead of evolving it during the game. But, they could also make the story segments that tie in this kind of stuff optional, I“d imagine. Or tie it to your Rotom as well (assuming the one in your PokÃ©dex can travel with you as a member of your team). Could you imagine stacking some kind of Rotom evolution on top of its already numerous forms? I don“t really have a grand or sweeping statement to make this week. Just wanted to show you what the Internet“s been clamoring about since Big Reveal #2. If you want the scoop on Ash“s Greninja, the episode where it first happens is called â€œA Festival of Decisionsâ€. There's more fun in "Meeting at Terminus Cave!" Both these episodes are on PokÃ©mon TV right now, but they may not be there long. I feel like the whole â€œit hurts the Trainer as well as the PokÃ©monâ€ angle of Synchro Evolution is much better served to the potential narrative of Sun & Moon versus mechanics. But I guess we“ll see. Know what else I think we“ll see during the Big PokÃ©mon Special Thing planned at E3 next week? The announcement of PokÃ©mon Gold, Silver & Crystal for the 3DS Virtual Console. PokÃ©mon RBY sold a cool 1.5 million copies, after all. I“ll be taking next week off, since Barrel and I will be on the show floor at E3. But if the stars align and I cross paths with Mr. Masuda while wandering, I might Mega Evolve.